member Initial jobless claims fell 1,000 to 400,000 for the week ended July 30. Continuing claims, which lag initial claims by one week, fell 10,000 to 3.73 million. Initial jobless claims have ranged between 412,000 and 428,000 for three straight months. The main message is that firms are not hiring at a robust clip. member The unemployment rate stayed at 9.1%. The private sector created 17,000 jobs. 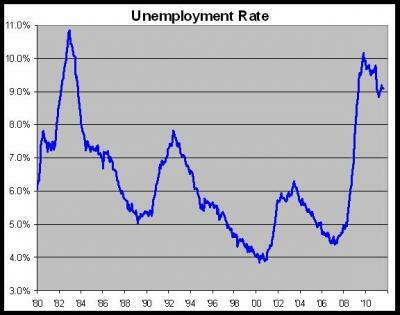 Breaking out the digits, the unemployment rate increased from 9.092% to 9.093%. Over the last seven years, the labor force has grow by 6.03 million and there are only 54,000 new jobs. The economy showed no job growth in August, the first time there has been no increase in net jobs in the United States in 11 months. The flat performance in the job market was down sharply from a revised 85,000 gain of jobs in July, the Labor Department said Friday, and was far below a consensus forecast by economists of 60,000. The unemployment rate stayed constant at 9.1 percent in August. The nonfarm payrolls numbers were unchanged in August after a prolonged increase in economic anxiety that began with the brinksmanship in Washington’s debt-ceiling debate and was followed by the country’s loss of its triple-A credit rating, stock market whiplash and renewed concerns about Europe’s sovereign debt. The jobs figure, a monthly statistical snapshot by the Department of Labor, may appear more negative because it does not include 45,000 Verizon workers who were on strike when the survey was taken. member The economy created 103,000 jobs in September. The unemployment rate remains at 9.1%. The good news is that the economy added 137,000 private sector jobs. 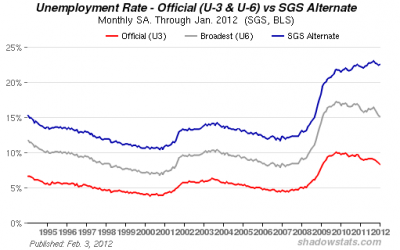 Also, the number (private and non-private) for August was revised higher from zero to 57,000 jobs. 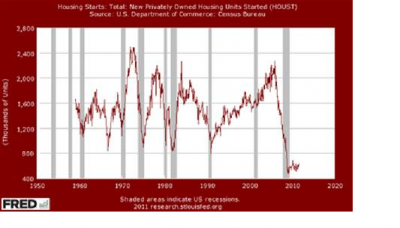 The July number was revised higher from 85,000 to 127,000. The October ISM just printed at 50.8 which is a decline from 51.6 for September. Economists were expecting a reading of 52. 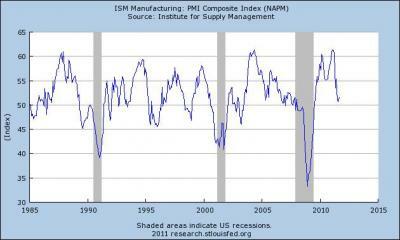 Whenever the ISM is over 50, it means the economy is expanding. When it’s below 50, it’s contracting. 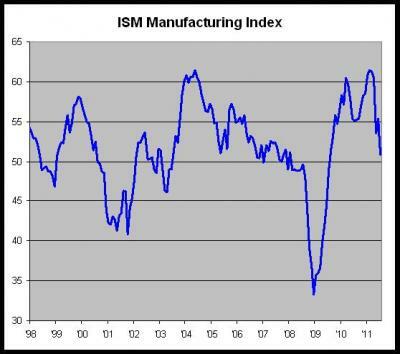 The ISM has fallen between 50.0 and 52.0 a total of 89 times, just five have been recessions. 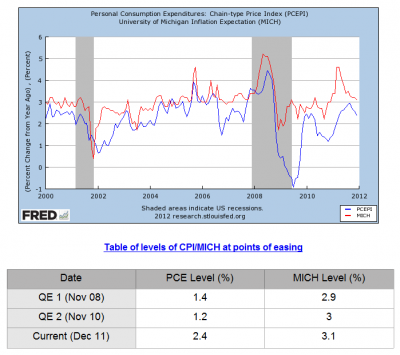 member How can the Fed and the ECB print as much as they did and not produce inflation? In very simple terms all that money was not meant for public consumption and it did not produce one bit of growth. It went to a select few and the bill was passed to the many. 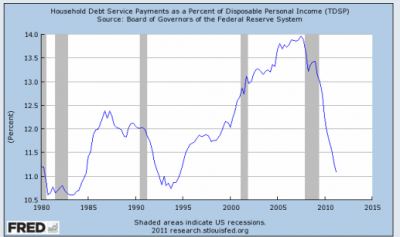 Debt ballooned as the economy and the tax base shrunk and that is an untenable situation. More printing, and there will be more, will only serve to crowd the private sector out of the debt markets more than they are today. Today’s banks are like pigs at a trough and they are insatiable. They have over US $700 trillion in derivatives to deal with and it will eventual destroy the system as it stands today. The only real solution id to write debt off, but again we have no political will for that. Non-farm payrolls rose by 120,000 in November, and 140,000 private sector jobs were created. Since the labor participation rate dropped, the unemployment number dropped down to 8.6% which is a big move considering the economy didn’t create that many jobs. I looked at the details and the jobless number actually comes out to 8.645%. I’m not exaggerating when I say that if November had been 12 hours shorter, the figure could have rounded up to 8.7%. The October NFP was revised to a gain of 100,000 while the September number was revised to a gain of 218,000. What you are about to read should absolutely astound you. During the last financial crisis, the Federal Reserve secretly conducted the biggest bailout in the history of the world, and the Fed fought in court for several years to keep it a secret. Do you remember the TARP bailout? The American people were absolutely outraged that the federal government spent 700 billion dollars bailing out the "too big to fail" banks. Well, that bailout was pocket change compared to what the Federal Reserve did. As you will see documented below, the Federal Reserve actually handed more than 16 trillion dollars in nearly interest-free money to the "too big to fail" banks between 2007 and 2010. So have you heard about this on the nightly news? Probably not. 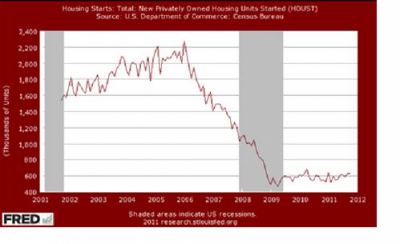 Lately Bloomberg has been reporting on some of this, but even they are not giving people the whole picture. The American people need to be told about this 16 trillion dollar bailout, because it is a perfect example of why the Federal Reserve needs to be shut down. The Federal Reserve has been actively picking "winners" and "losers" in the financial system, and it turns out that the "friends" of the Fed always get bailed out and always end up among the "winners". This is not how a free market system is supposed to work. But some other dollar figures have been thrown around lately regarding these secret Federal Reserve bailouts. Let's take a look at them and see what they mean. The $1.2 trillion figure represents the peak outstanding balance on these loans, not the total amount of all the loans. On December 5, 2008 the "too big to fail" banks owed this much money to the Federal Reserve. Many of them could not pay these short-term loans back right away and had to keep rolling them over time after time. Each time a short-term loan got rolled over that represented a new loan. "As a result of this audit, we now know that the Federal Reserve provided more than $16 trillion in total financial assistance to some of the largest financial institutions and corporations in the United States and throughout the world"
Why aren't leading Republicans and leading Democrats crying bloody murder over this report? Today, the "too big to fail" banks are larger than ever. The total assets of the six largest U.S. banks increased by 39 percent between September 30, 2006 and September 30, 2011. So now they are more "too big to fail" than ever. Most Americans do not realize this, but the truth is that the Federal Reserve is not part of the government. In fact, it is about as "federal" as Federal Express is. The Federal Reserve has admitted that they are a privately owned institution in court many times, and you can see video of a Federal Reserve employee admitting that the Federal Reserve is privately owned right here. This is a point that I made in my article yesterday. 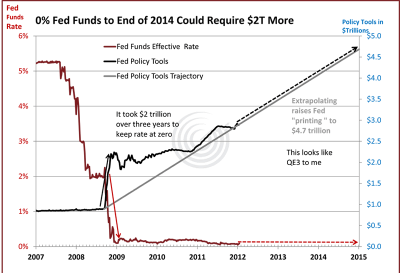 The Federal Reserve decided this week that it is going to provide "liquidity support" to Europe. If the American people do not like this move, that is just too bad. We do not get a say in the matter.